The Global Arbitration Review (GAR) included our integrated arbitration team in its GAR 100 list featuring the world’s elite global arbitration firms. Additionally, five of the team’s practitioners are featured in the Who’s Who Legal: Arbitration guide. Connectedness and collaboration helped our regional international arbitration practice become the first team from the Baltics and Belarus to join such prestigious ranks. Lawyers featured in the directory are highly recommended for their expertise in resolving complex international disputes. GAR is the leading resource on international arbitration news and community intelligence. Its GAR 100 guide ‒ which helps users to find the right firm in the field of arbitration ‒ is based on an evaluation of recent work experience, reputation and credible arbitrators. 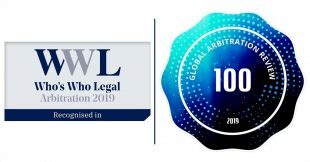 Since 1996 Who’s Who Legal has identified the foremost legal practitioners in arbitration and multiple other areas of business law, acting as a reference source for companies seeking to corroborate the reputations of expert lawyers recommended by another party.